Sociologie Wine™ is pleased to present “Raise Your Glass Dallas,” a Boho chic garden party featuring wine, food, fashion, and live music hosted at Texas Discovery Gardens on Sunday, April 15 from 1 p.m. to 6 p.m. Dede McGuire, of K104 FM’s “Dede in the Morning” show, will serve as the event MC for the afternoon. A highly anticipated wine-tasting day party, “Raise Your Glass Dallas” is an elevated experience of chic style, grace and cocktails that will be set in the scenic Fair Park backdrop of the beautiful Texas Discovery Gardens. This delightful affair will feature Sociologie Wine’s newest wine parings, tantalizing bites prepared by local chefs, specialty vendors for shopping, live entertainment by independent performance artists, exhibits by talented visual artists and music by Grammy award-winning DJ Babey Drew. Guests can also enjoy customized wine cocktails made by local mixologists, swag bags filled with amazing surprises, a life-sized frame for capturing social media photos, and an array of fun games on the lawn. Open to the community, tickets range from $50 to $200 and are available for purchase at www.raiseyourglassdallas.com. A percentage of proceeds raised at this year’s event will benefit local charitable and nonprofit organizations that serve women and girls: Dallas Women’s Foundation, IGNITE, PeopleFund and Step Up. Sponsorships are also available and range from $1000 to $5,000. For sponsorship opportunities, please contact cheers@RaiseYourGlassDallas.com. 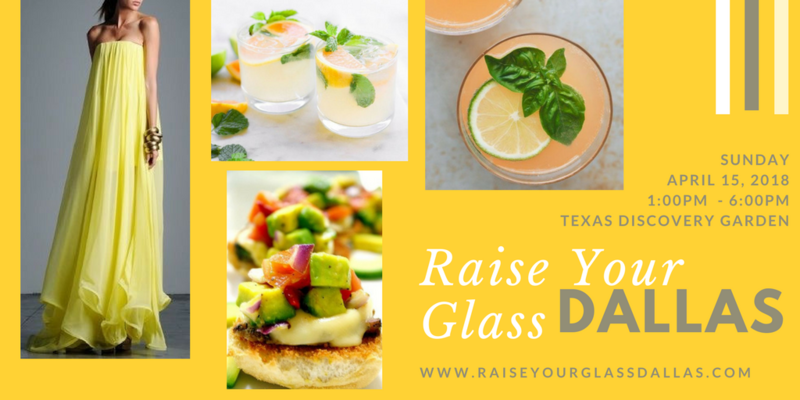 For event updates, stay connected on Facebook and Instagram @RaiseYourGlassDallas. Sociologie Wine™ began as a beloved party favorite surrounded by fun music, wonderful conversation, and lovely family friends. In her very own kitchen, using her soirées as inspiration, founder Amy Hampton customized an assortment of sophisticated wines blended to perfection with delicious fruits and natural ingredients. In early 2010, with passion and a plan, she diligently sought to create Sociologie Wine™ to capture and epitomize the “art and science of entertaining socially chic”. In 2012, after teaming with a winery nestled in the heart of the Mimbres Valley of Deming, New Mexico, Sociologie Wine™ launched with two varietals in Texas – Blushing Rose and Red Berry. To learn more about Sociologie Wine™, please visit wwwsociologiewine.com and Stay connected on Facebook, Twitter and Instagram @sociologiewine.